Because when it comes to stock, sometimes us veggies get the short end of the stick, for real. With only vegetables, salt and water (ok and some herbs and spices if we’re feeling jaunty), the vegetable stock that flavours all the dishes of our life often just tastes like vegetables and salt and water. This can be ok if it’s going in a dish with other, stronger-flavoured items, but sometimes the broth has to hold up on its own. I make a lot of stock, and I usually have a bag of offcuts and goodies in the freezer with which to do so. Generally it’s the aforementioned simple stock with a base of carrots, celery, garlic, tomatoes, bits and bobs, this that and the other. And salt and water. And it’s fine, it does what it needs to do when I need it to. It’s delicious even. Sometimes though, recipes require a richer stock flavour (like if you’re replacing beef stock or making French onion soup or somesuch) and that’s when I really get my stock game on. I’ve found over the years that by putting in just a couple of little extras, and by simmering the stock for ages (I’m talking days if you’ve got ’em! ), you can get yourself a really complex, flavourful stock that can hold its own in almost any situation. Then you can make tortellini en brodo AND LIVE HAPPILY EVER AFTER. 1. Gather your vegetable flavouring ingredients and a very large pot. 2. Heat some olive oil in the pot and roughly chop your ingredients. 3. Saute your vegetable ingredients in olive oil over a medium heat for 10-20 minutes. 4. Add your water, salt, spices, and herbs and bring to a boil. 5. Simmer as many hours as you can, topping up the water when it gets too low. The magic ingredients I use to make sure the broth is rich and complex are: dried porcini or shiitake mushrooms, and nutritional yeast. Why? Because dried mushrooms are tiny little umami flavour bombs (exactly what you’re going for in this situation) and nutritional yeast is a deep, salty flavour-enhancing powder of goodness that lends a bit of complexity to whatever dish you’re making. I also use any/all of these: whole onions, skin on and quartered, smashed garlic cloves with the skin on, carrots, celery (including the root and leaves), tomatoes, mushrooms (stems and all), leeks, fresh parsley, vegetable peels and scraps, bay leaves, whole peppercorns, and a lot of salt. I cover all the sauteed and deliciously caramelised stock veggies in as much water as the pot will hold, and add the parsley, bay leaves, peppercorns, and salt. 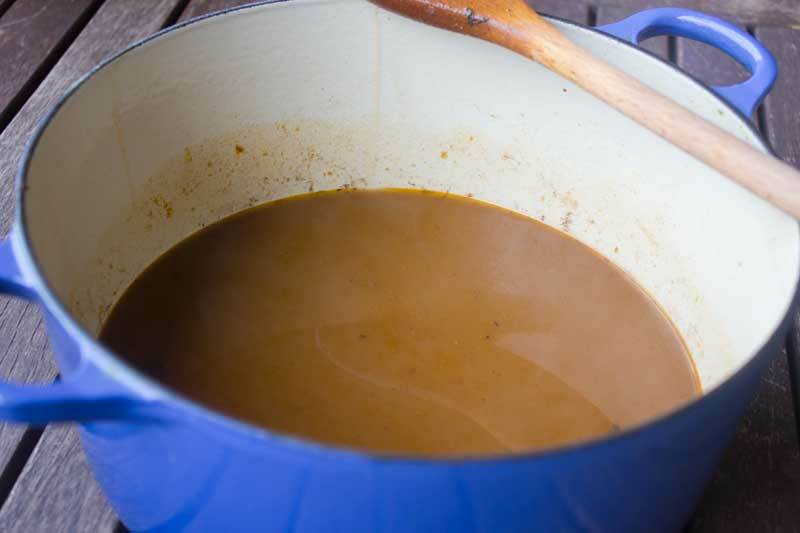 What makes this stock so deeply flavoured is the caramelisation of the veggies, the dried mushrooms and nutritional yeast, and the length of time simmered. You can skip bits, but it’s best if you don’t. Too much porcini mushroom will make it taste like a porcini mushroom stock – you won’t be able to taste anything else. This can be good but probably not what you’re after. 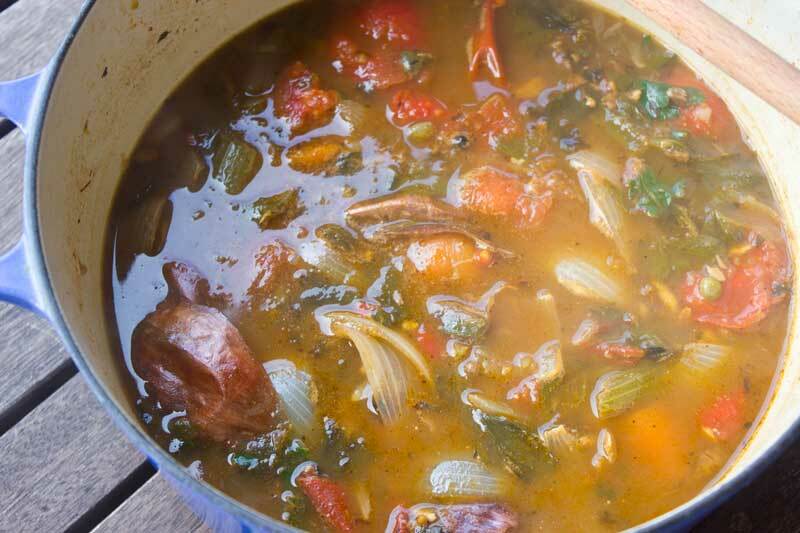 If you’re simmering for a couple of days, keep throwing your scraps in the pot as you make other dishes. Your broth will have different flavour layers and that’s always a good thing. I often leave the stock in the pot overnight on the stove overnight and simmer it again in the morning. If you’re worried, pop it in the fridge overnight. I’ve been known to also throw in a knob of butter toward the end. Go forth and stock, internet! You’ll be glad you did. That I can understand plus turning the oven on. You’re very welcome! I hope you enjoy it. I’m torn. I just use stock cubes, I don’t buy the carton stuff. So making stock seems very time consuming. And also I have reservations about how much electricity I’d be using to simmer for so long?? Obviously I can control what ingredients/salt go into homemade stock though, so I’m intrigued. Just very torn! Mushrooms are evil. I now however have a use for the nutritional yeast the health food shop sold me by telling me it was brewers yeast! haha I promise you can’t taste them! They’re just there for that umami that veggies on their own don’t provide. But yes use the yeast! Poor thing, did you end up getting some proper brewer’s yeast after all that?